After having worked in the EcoCircuitos office in Panama City for about 1 ½ months now, my task as the new German intern and therefore one of the representatives of the company was to start getting to know the services that exceed our office-doors. Having read the description of our tour many, many times, and having added it to itineraries of our clients almost every day, I knew more or less what was expecting me. Nevertheless, participating in the tour in person was a way more exciting experience. On our way to the Soberania National Park, guide Irvin and driver Roberto were a great team in knowing where to pass and what to explain to us. The 1 hour drive went by quickly as Irvin gave us some insight about different parts of the City, the Canal and various bridges we passed. As we got out of the car, we instantly noticed the change of climate. Although it was only a short drive, the humidity seemed to have risen a 30 %. During our hike in the forest Irvin apparently knew every little detail that happens in nature: whether it was spotting any type of animal or (tiny) insects, where they would go, what kind of sounds they make or what kind of trees and plants can be used for medicine or survival – Irvin knew it. Since we were almost alone, the sounds of nature you could hear while walking were stunning. I secretly imagined sleeping in the rainforest, surrounded by hundreds of bird and animal sounds. I personally enjoyed listening to how Panama´s indigenous tribes survive living in the forest, how they hunt, how they make sure they have sufficient water, or what kind of plants can be used for their housing or living in general. 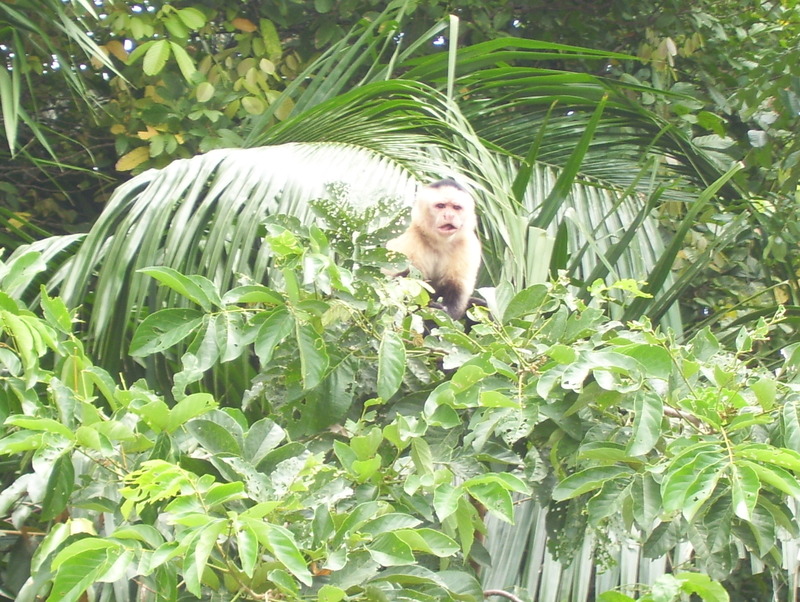 A highlight of the hike was the monkeys we spotted. Their sounds could be heard from far away, but we actually managed to walk by right where they were climbing the trees. Leaving the Soberania Park, we headed to our Jungle Boat Tour on the Chagres-River. I didn’t know what was expecting me, and was even more surprised when I found myself mentally back in the Tortugero National Park I had been to in Costa Rica a few years ago, definitely a somewhat jungle-experience. We spotted iguanas, crocodiles, and again about three different types of monkeys. Irvin was not just quick in spotting animals, but he was also more than up to date on his information about the river, its history and the plans for the future. The many little islands covered with tropical forest and wildlife we saw from the boat are supposed to be connected in the next few years, so that the animals have more space to live and spread. It was good to hear that something like that will be happening in the future. All in all I was more than content with what I saw and learned on my first EcoCircuitos tour. I´m looking forward to the next experience and will definitely share it with you!